Marcus Piavonius Victorinus was a soldier of considerable ability. Victorinus had risen to a high position under the Gallic Emperor Postumus and was widely considered to be his logical successor to the newly found throne of the Gallo-Roman Empire. After the assassination of Marius, Victorinus indeed at last became the Gallo-Roman Emperor. Little is known of the history of his short reign, but it appears that Spain seceded from his empire soon qfter his accession. 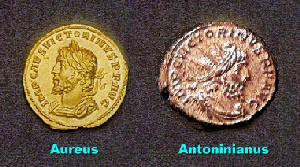 There were also troubles in Gaul, culminating in a rebellion at Augustodunum (Autun). Victorinus succeeded in taking the city after a siege of seven months, but soon afterwards he was murdered by one of his own officers at Cologne. It is not known exactly why Victorinus was murdered. It might have had something to do with his reputation for taking other men’s wives. Through the influence of his mother Victoria, he was suceeded by Tetricus I who honored his memory in a brief series of commemorative coins.